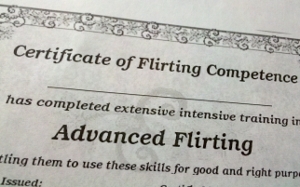 I'm facilitating two workshops at NorWesCon, Flirting 101 (Fri 4/22, 7pm) and Advanced Flirting (Sat 4/23 10pm). If you're going to the con, do join us. If you've never been to one of my flirting workshops, give it a try. My conceptual frame is that flirting is for more than romance, it's an approach to connecting with people around any area of shared interest. It's a way to approach social interaction that is playful, respectful, and lowers the risks to both parties. We'll discuss flirting theory, practice approaches, examine rebuffs, and explore the frightening world of rejection and acceptance. I really enjoy these workshops. They can be full of lively banter, playful and (yes) flirtatious exchanges, outrageous humor, and risk-taking made fun.